We spent 7 nights in Tahiti as a family, two boys 4 & 6 and dad (aka Uge) on the tools some of the time. Even I couldn’t stop taking photo’s – this place is like a hedonistic paradise where you gasp at the beauty everywhere you turn. It’s untouched, the people are kind, generous and just plain nice. Most speak French, a few Tahitian and speaking English outside of the hotel is not preferred. If you’ve got the time – do it like us. We flew Air New Zealand – they are our exclusive airline partner and are an exceptional airline. New Zealanders – nice people (if I do say so myself, I have a kiwi passport). 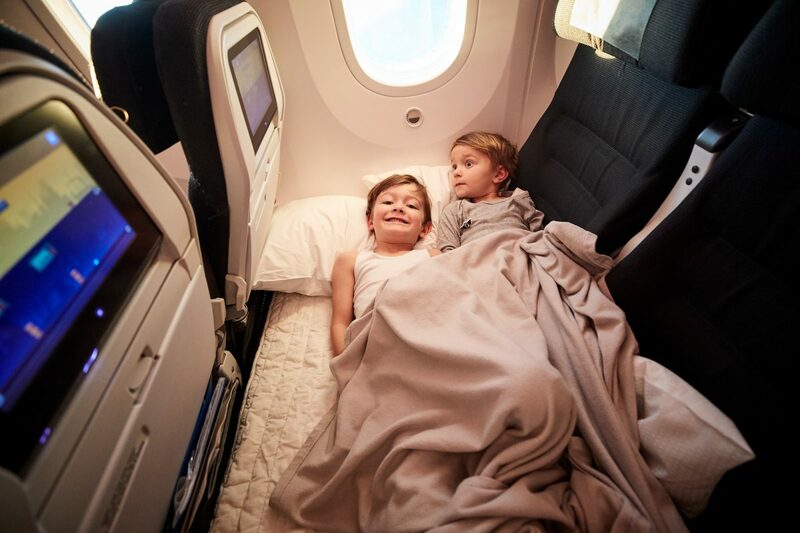 We had skycouch on the way over and way back – it means you and one of your children can lie down across 3 seats – the foot rest pops up and makes a bed, it’s the best for babies, toddlers or kids in general and allows you to get some sleep too. It sure beats sitting upright on late or overnight flights. We flew Sydney Auckland (stay at the Novatel Auckland, you push your bags across the road and your there from the gate) – we stayed overnight (and caught a morning flight Auckland – Tahiti). You and the kids arrive fresh – not ratty with mum and dad arguing over directions, in the rent a car. We hired a car – drove the 1.5 hour drive to Teahuppo and stayed at Vanira Lodge on the hill overlooking the bay. It’s rustic, simple – but beautiful. My kinda place, yoga, a pool for the kids and gardens so tropical and lush you will think you’ve landed on the set of Moana. We spent our first day at the world-famous break Teahuppo – it wasn’t pumping according to Uge – but it was working, to me it was a bit like watching Laird Hamilton at Jaws in his latest movie – ‘not working I thought to myself’ (this thing looks like it could kill you on a not pumping day), it’s fast it’s furious and hollow – it’s one small slip and ya on the reef. Ultimate respect for those that master it. 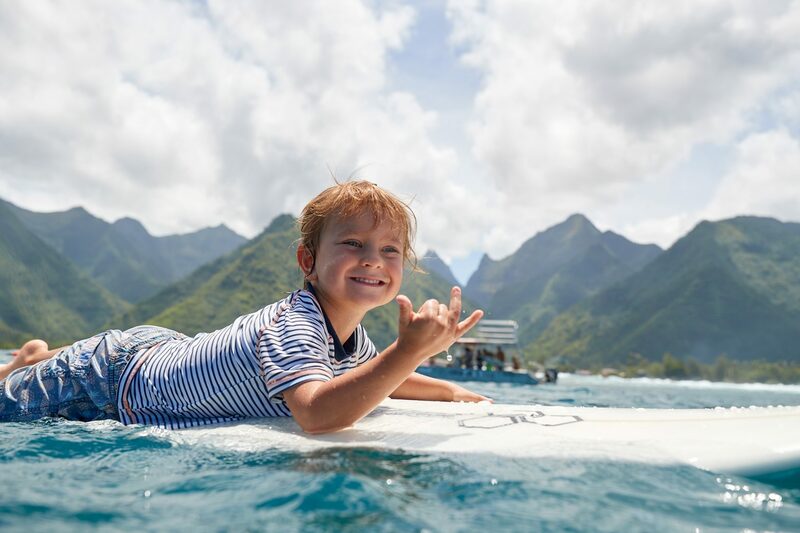 We went with local Cindy from Tahiti Surfari – saw dolphins on the way out, sperm whales when we were out there and swam off the back of the boat in the channel, a hop skip and jump from where the wave breaks. It’s exhilarating, breath-taking and mesmerising watching people surf this wave. We spent 3 nights here and if I could, would have sat and watched that wave for 3 days. We as a family spent 5 hours on the boat one day and none of us wanted to get off. Next, we went to Moorea – We caught the Aremiti Car & passenger Ferry and took our rent a car on the boat. Kids loved the novelty of this, it’s easy and again you’re not schlepping ya stuff everywhere as it’s all in the boot. As soon as you arrive you are wowed by the mountains, the green and the bluest of blue bays you have ever seen. It’s just that beautiful. Nah it’s better than you can imagine. We had 4 nights at the Hilton Moorea on a water villa. 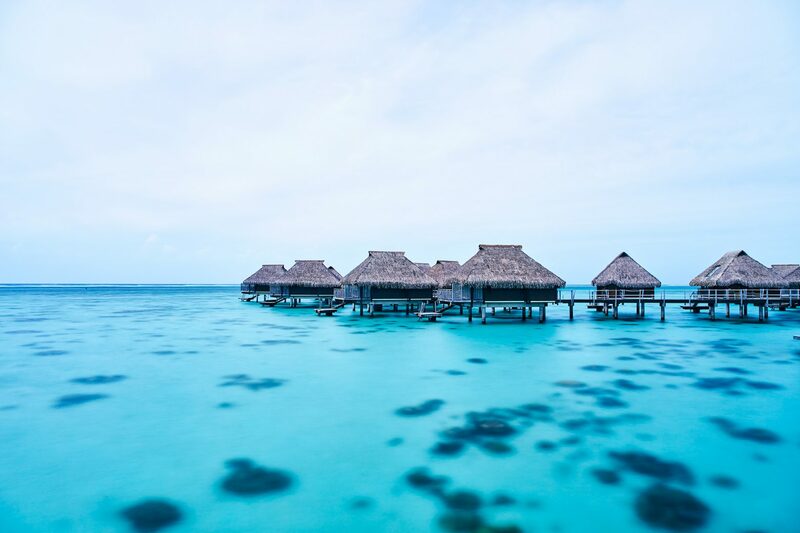 If ya gunna go all that way, save until you can get a water villa – it makes all the difference to your stay. 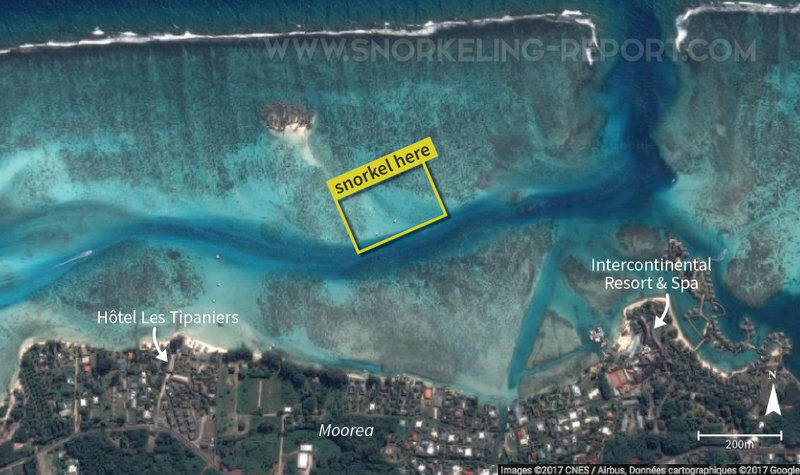 You spend more time in the water on the water and living the Tahitian dream this way. Our boys swam most of the day off the deck and you can even watch the fish from a glass bottom hole in your room. We are not a sit by the pool or beach kind of family – it may have been nice to do this once or twice, but our kids are action packed. We snorkelled, took out the stand-up paddle boards and canoed. There is so much sea life – you just can’t get enough. 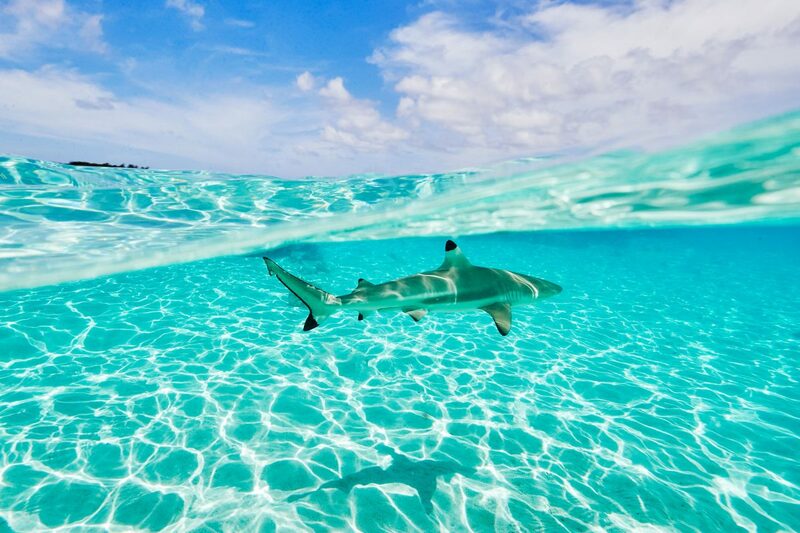 Moorea is famous for swimming with black tip sharks and Rays. You do it from a little beach called Sunset Beach – it’s about 8 minutes from the Hilton (driving) and when you see a sign ‘Les Tipaniers’, park in the car park across the road, walk down towards the beach where it says reception and you’ve found it. We hired to kyaks and paddled out with our boys on the front of each of them. It did make it a little tricky as we couldn’t anchor them – so work out what’s best for your family. You can stand in the water though, it’s about neck high. Take scraps of squid or bread with you in your hand and this will allow you cares the stingrays’ undersides. Spike our 4-year-old got a ray massage this way – he loved it. It was literally careesing his face. Across from the where you swim with the rays is a little island called coconut beach – we didn’t go but apparently, it’s worth it, great for lunch and a day hanging on the beach and snorkeling. 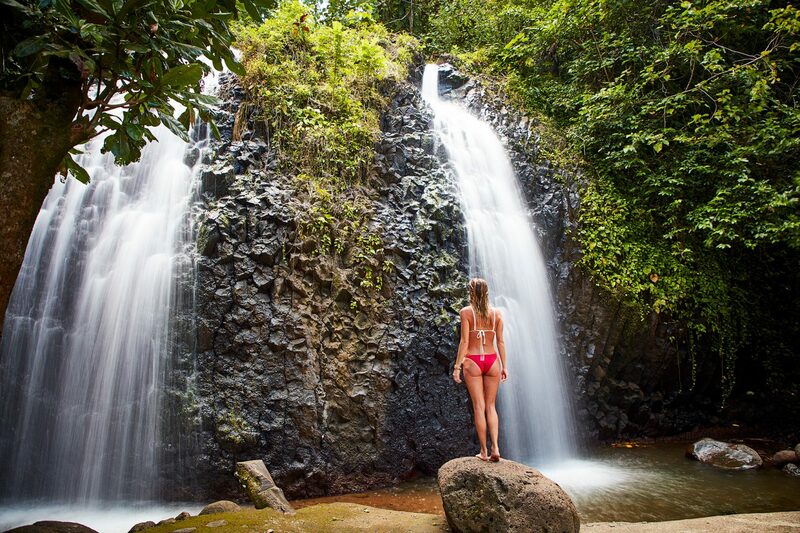 Corallina tours is the best to get there. Chez Fred- blue food truck located right after the haapiti center. It’s small bright blue and has not good but great food and very affordable! Owned and run by the friendly Fred. We ate here twice and it was the best food on the island. It gets busy, cause it’s popular Don’t expect much food wise at the hotels. We did a drive of the island – it’s stunning, worth it. Takes about 45minutes – an hour. Stop and swim in the bluest of bays on the way. Drive to Mt Rotui, it’s where you start the belvedere walk and will give you some great views of the mountains. It’s a 5min drive from the Hilton. Turn right as you go out and then before Cooks Corner turn left. If you explore around you will see the pineapple plantations. 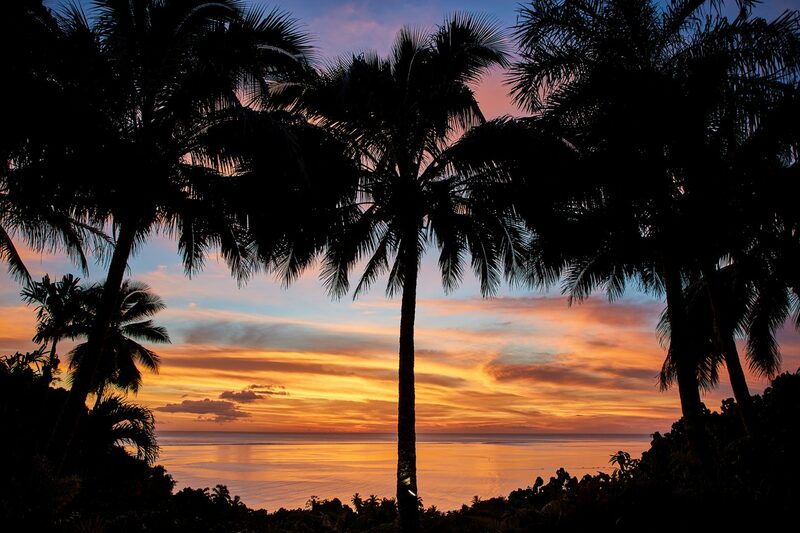 Club Bali hai hotel has one of the best views of cooks bay! You’ll spend more time in the water than on the land – it’s spectacular, warm and crystal blue. It’s a family destination and for lovers – you will re-connect in nature and the joy it brings you to see your kids so happy swimming around in the sea, I will keep with me forever.